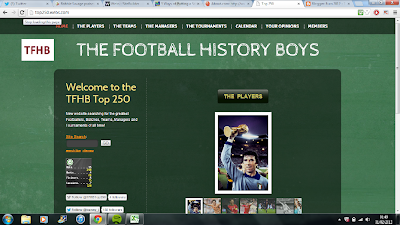 On 1st February The Football History Boys will be celebrating its third birthday! Whilst in our second year of our history degrees at Swansea University we decided to ask the question we all want answered - 'Who is the greatest footballer of all-time?' 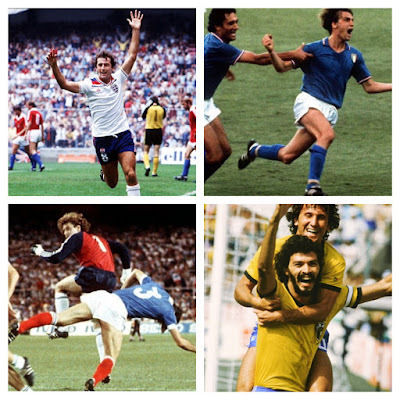 - The usual suspects were thrown about by us and our other housemates....Pele, Maradona, Messi....but as we looked deeper into the histories of these respective players, we began to notice other names frequently coming to our attention. 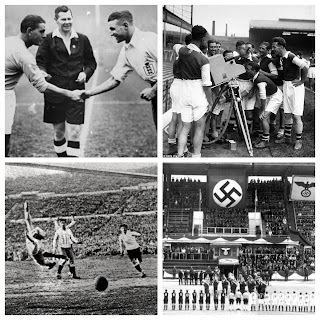 The likes of Ferenc Puskas, Billy Meredith, Lily Parr - footballers whose stories were yet to really be dissected. So we set ourselves a task - to discover the incredible history of the beautiful game, from the Victorians to the present day. We have written over 150 pieces to date, the majority by Gareth and myself, but also with the amazing contributions from over 20 guest writers - many of which are our friends and many from our wider readership. Indeed are initial aim was achieved in early 2014 as we released the #TFHBTop250 countdown. This was our first vote which received over 4000 nominations - leading to eventual winner Zinedine Zidane. Indeed, the top 250 managed to extend our following and lead to us putting more attention into our blogs. From this, we began to start trawling through the immense newspaper archives from as far back as 1700 in order to gather authentic information of the sport, some of which had never been discussed before. Following our increased dedication to the writing and upkeep of the page we managed receive a nomination in the Football Blogging Awards thanks to votes from friends, family and followers. 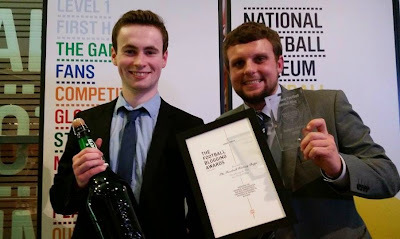 After a trek up to Manchester we were pretty shocked to actually win the 'Best New Football Blog' award following the Judges recognition. This led to the opportunity to write for BBC Sport and speak on a guest panel in London at the Sports Analytics convention . This gave us the chance to then review a number of football books as well other sporting guides. We have covered a great deal of the last 150 years of football, so one year ago we set up another project - The Sporting History Boys. 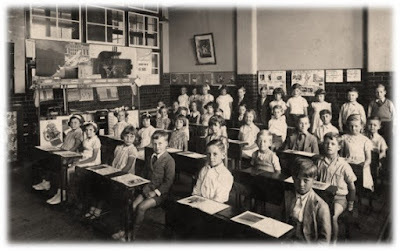 However, following the completion of our degrees, we have had to enter the 'real world', one which has led to us both pursuing careers in education. Unfortunately, in terms of the running of the blog and regular updates, we have been lacking the time to do so, needing some endurance training to get used to it all! 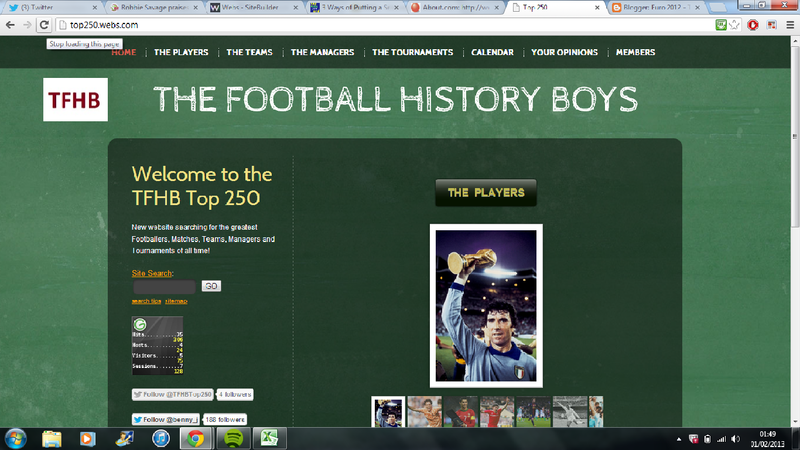 Nevertheless, we are immensely proud of what we have set up and wanted to engage our readers once more - this time with a new countdown of the best players ever - not the top 250, but the top 100 - a more exclusive list which will hopefully generate a higher number of votes and interaction. As Ben said, the original #TFHBTop250 countdown is what started it all for us, the combining of our great loves... football and history! Now as we approach our third birthday, with a dedicated, regular following we think it's about time to repay those players who gave us stuff to write about. We're searching for an updated #TFHBTop100 and we need your votes. 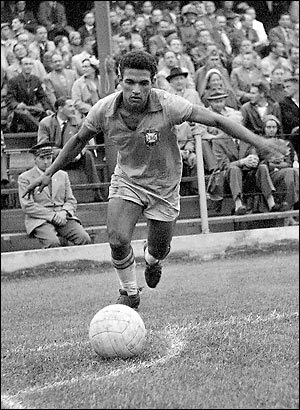 "One of the most talented footballers the world has ever seen, the splendour of his intuitive imagination crystallising into outrageously joyous acts, sporting taunts on the pitch. Michel Platini (15th) - The past few months have not been pleasant for Michel Platini, the 60-year-old Frenchman booted out of FIFA for ties to the corrupt reign of Sepp Blatter. However, on the pitch Platini was a magician. The midfielder earned 72 caps for France, winning the European Championships and a whole host of club honours during his time with Nancy, Saint-Etienne and Juventus. John Charles (21st) - The greatest Welsh footballer of all time (although Gareth Bale may have something to say about that!). Swansea born John Charles was born in 1931 and whilst never winning any major international honours, Charles had a fine club career. Leeds United uncovered Charles' talents with 297 league appearances and 157 goals (not bad for a centre half!). In 1957 John Charles furthered his career with Juventus, winning 3 Scudettos and 2 Coppa Italia's. The Daily Mail's Michael Walker wrote: "In 1997 — 40 years after his signing — Charles was voted the greatest-ever Juventus purchase, ahead of Zidane, Platini, Boniek and Brady. Four years later, Charles was then acclaimed Serie A’s greatest-ever import, this time leaving Maradona, Van Basten and Liedholm behind." Ferenc Puskas (25th) - A TFHB favourite, Ferenc Puskas was part of the famous "Mighty Magyars" squad, along with Sandor Kocsis, that won the an Olympic Gold medal and came runners-up at the 1954 World Cup. Forward Puskas shot to notoriety in the United Kingdom after his Hungary side battered England 6-3 at Wembley and then 7-1 in Budapest, stunning those who believed England to be the world's best. Amassing an incredible 84 goals in 85 games for his nation, Puskas was a hero with Budapest side Honved and of course, Real Madrid. Kenny Dalglish (26th) - Kenny Dalglish is not just a name well known to Liverpool and Celtic fans but football admirers across the world. Scotsman Dalglish represented his country 102 times and in the English game won 6 First Division titles with the Reds, as well as 3 European Cups. Paolo Maldini (9th) - When you talk about some of the best defenders to have ever played the beautiful game, Paolo Maldini always rightly features. 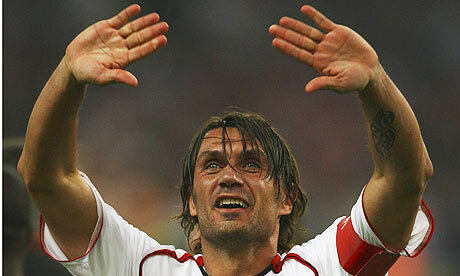 The epitome of a 'one club man', Maldini played over 900 matches for AC Milan between 1985-2009. Maldini also earned 126 Italian caps, finishing as runner-up at the 1994 World Cup. His personal trophy cabinet is packed with 7 Scudettos, a Coppa Italia, 5 Supercoppa Italianas and a remarkable 5 UEFA Champions Leagues to name a few. Sir Alex Ferguson once said: "He has a wonderful presence, competitive spirit, athleticism, and although not the world's greatest technically, he has influenced all the Milan teams during his wonderfully successful era." We put together a list of 300 players' names, dating back to the turn of the twentieth-century. From here we have set up a poll which is simple enough to vote on - just pick 3-5 players and click submit! From this we will gather who the public really believes is the best player in football's immense and intriguing history. Nice post and the information is awesome. You people can also take help from the latest sports news to get updated information regarding your favorite sports and sports person being a fan. And being a fan its your duty to know everything in detail.